The Buffalo Nickel has been a long time favorite for collectors. The obverse and the reverse of the coin both display uniquely American images. The coin was designed by James Earle Fraser and minted from 1913 to 1938. It’s continued popularity caused the design to be used on a 2001 commemorative coin and the 24 karat gold bullion series which began in 2006. The obverse of the Buffalo Nickel shows a Native American Chief in profile. The image was modeled after three Native American chiefs, Iron Tail of the Sioux, Two Moons of the Cheyenne, and John Big Tree of the Seneca Nation. The word “Liberty” appears at right and the date is on the shoulder. The placement of the date on a higher point of the coin caused it to experience wear in circulation that caused many Buffalo Nickels to become dateless. The reverse of the coin features the American Bison, colloquially referred to as a Buffalo. Although not positively identified, many believe that the coin’s designer James Earle Fraser used Black Diamond from the Central Park Zoo as a model for the image. The buffalo stood on a raised mound for Variety 1 of the first year of issue. This was changed to flat ground for Variety 2 and the remainder of the series. The alteration was done because the initial version had the denomination as one of the highest points on the coin, which would have caused it to wear off in circulation. The inscriptions “United States of America”, “E Pluribus Unum” and “Five Cents” appear on the reverse. The mint mark appears beneath “Five Cents”. 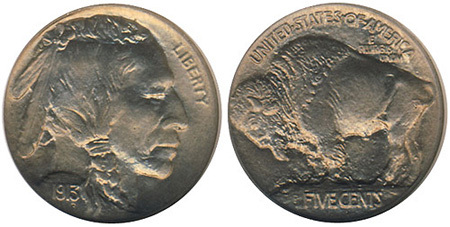 One of the most famous coins of the series is the 1937-D nickel variety that shows a buffalo with only 3 legs on the reverse. This coin was created when a Mint employee over polished a die to remove clash marks. In the process, he ground off one of the buffalo’s legs. Consequently, coins were struck with a 3 legged buffalo. Most of the coins reached circulation before the mistake was realized. Examples are now prized by collectors, especially in high grades.